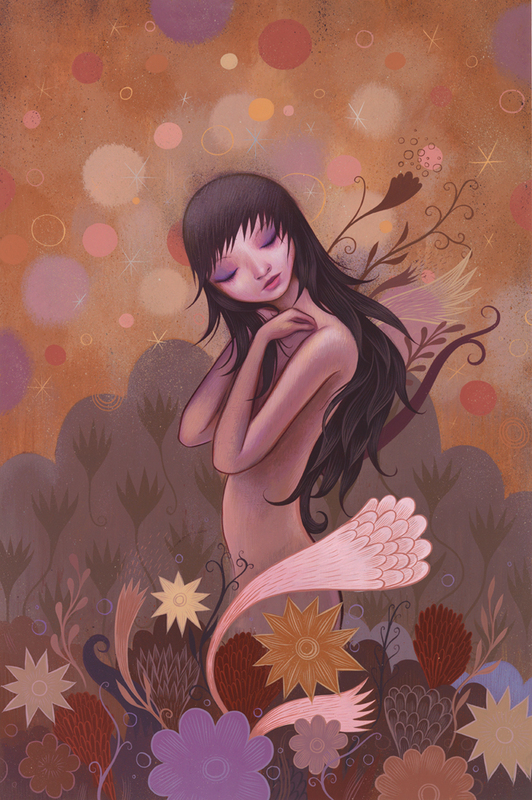 One of the shows we are looking forward to this weekend is Jeremiah Ketner’s “Morning Showers” opening on November 7th at the Melanee Cooper Gallery in Chicago.Â Ketner has really taken his work to another level with his recent shift to focusing on a central character and a mastery of his distinctive color palette.Â There really seems to be a comforting sense of balance to his compositions in this new body of work.Â He was gracious enough to take some time to answer some questions about the show as well as share some new images with our readers … after the jump. Arrested Motion (AM): Can you tell us a little about this show? Any themes? Messages you are trying to get across? 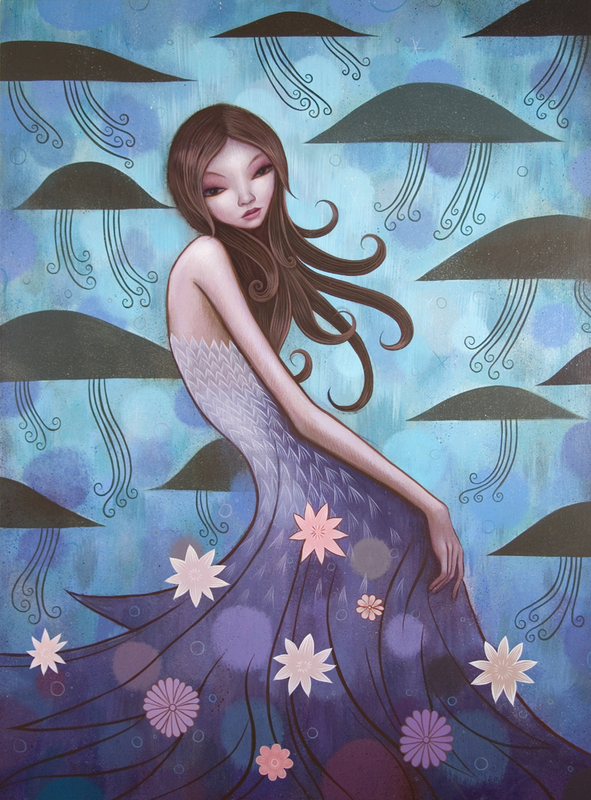 Jeremiah Ketner (JK): I came up with the theme for this show as I was taking my morning shower.Â My best ideas come to me as I am in the shower.Â There is something about being enveloped in a stream of water that allows me to become deeply entranced in my thoughts.Â The theme “Morning Showers” is a loose theme, open for translation. I have always been influenced by aesthetics, especially in Japanese design.Â From traditional kimono designs to flower arrangements I am fascinated with their use of color and design. 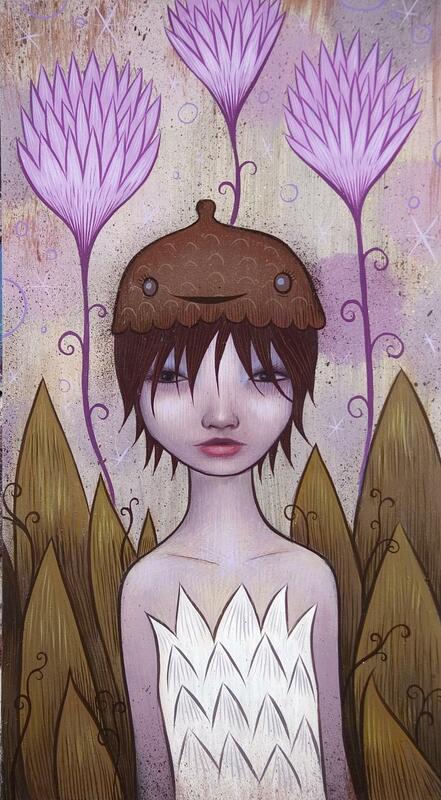 Â Nature is also a powerful influence.Â The change of seasons and floral patterns play a significant role in my work. I tend to shift my palette as the seasons change.Â Flowers and patterns are used to evoke a sense of depth as they become entangled with my subjects, creature and human. AM: We notice that there has been a little evolution in your style recently to include central characters in your paintings. Is this a conscious decision? What is your thinking behind this shift? JK: For a long time, my work has focused on the idea of finding happiness when things seem ugly outside.Â Bright colors, cute inviting characters and floral designs would populate imaginative worlds.Â Running with these ideas a new direction has emerged.Â The once friendly cute characters have grown up and now navigate a new imaginative landscape.Â As I close my eyes, visions of a central figure seem to always appear.Â Eventually they surfaced in my paintings and act as a focal point inviting the viewer into a playful place free of ugliness and filled with simplistic aesthetics. AM: What shows/projects are you working on in the future that you can share with us? I have a few shows coming up in the spring.Â I am particularly excited about showing at Rotofugi in a two person show with Julie West. I admire her work and think that we would make a fantastic duo.Â I am planning on making a range of wooden figures that will be painted in acrylics.Â There will also be a handful of paintings included in the show. Another exciting show is on February 7th at Black Maria Gallery. 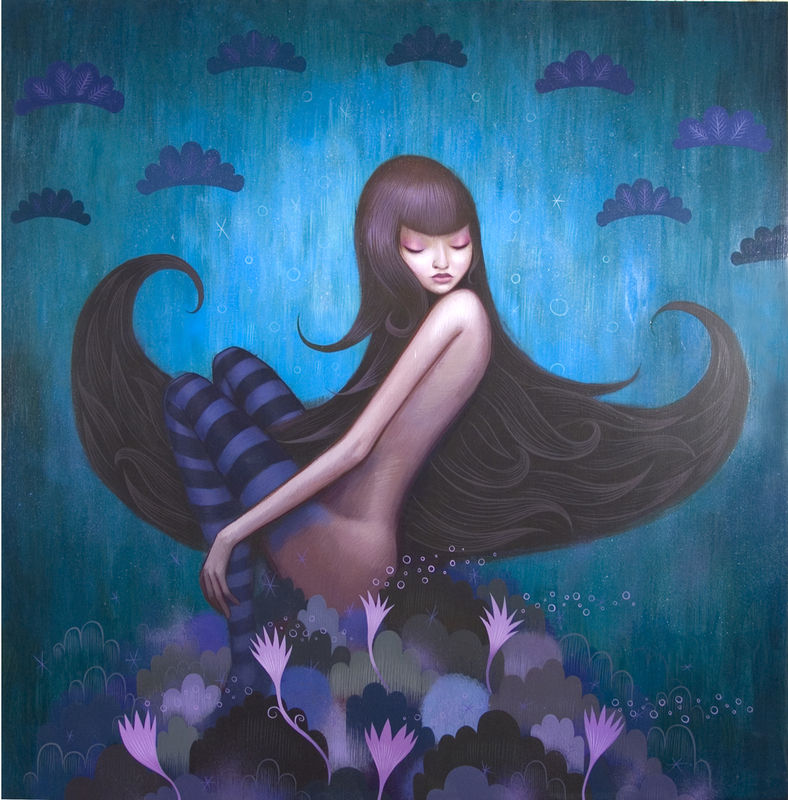 I will be showing with some really amazing talent.Â The two other artists are Tin & Kendra Binney. 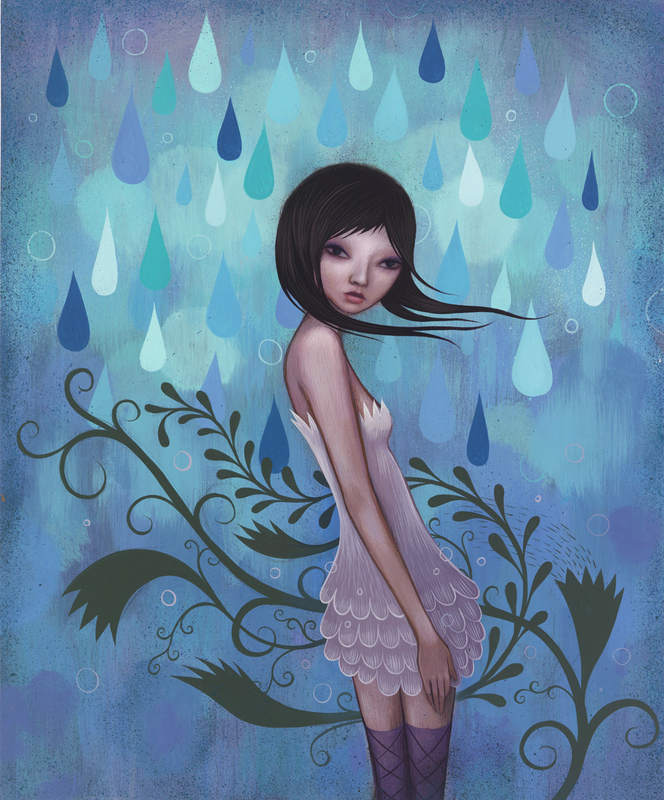 This May I will be in a three person show at Suite 100 Gallery in Seattle with Kendra Binney and Rudy Fig. I am also working on a line of apparel with TAG Galleries in Baltimore. That project should be released in the spring. AM: Thanks Jeremiah!Â Enjoy some more preview pics in the gallery below and please stop by for the opening if you can this Friday.Â Please contact Melanee Cooper Gallery with all purchase inquiries. 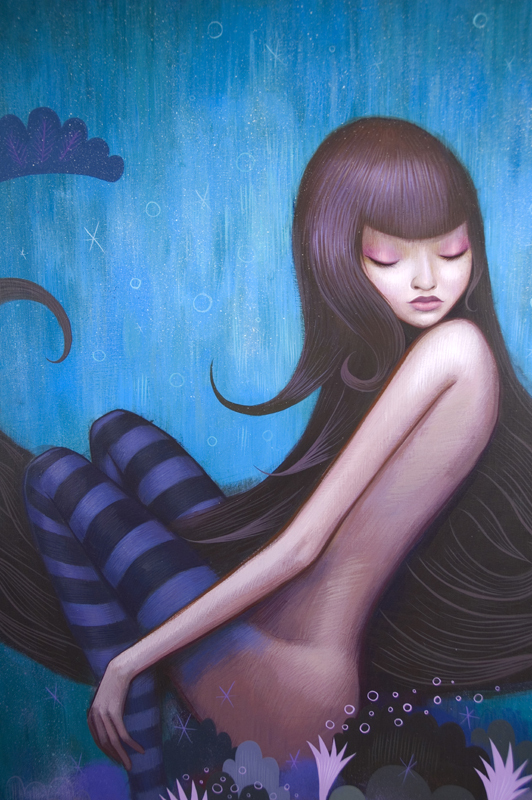 Categories: Art, Features, Interviews, Low Brow & Pop Surrealism, Previews, Shows & Events. 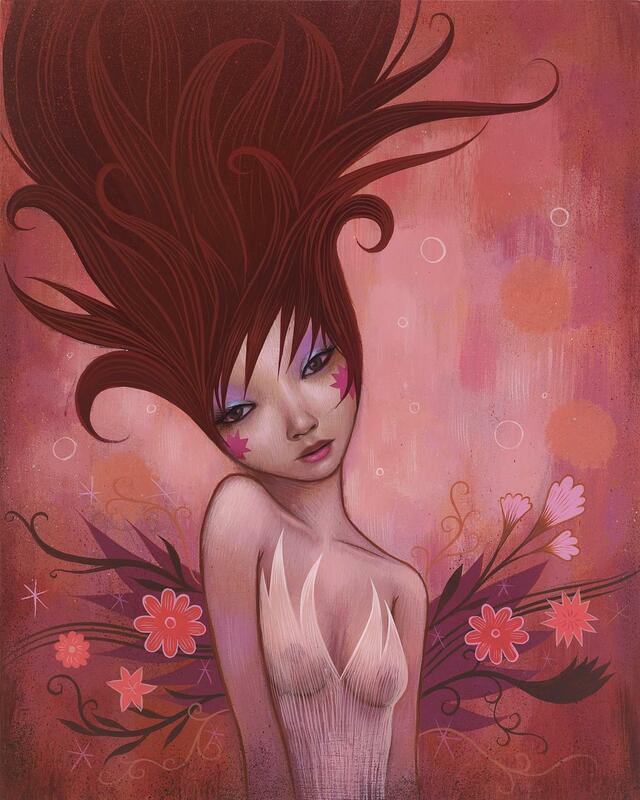 Tags: Features, Interviews, Jeremiah Ketner, Low Brow & Pop Surrealism, Shows & Events.